It has been a very warm and sunny weekend here. It is very hard to get in Fall Collection mood but I am making an exception for two pretty Dior nail polishes from Cosmopolite Collection for Fall 2015. 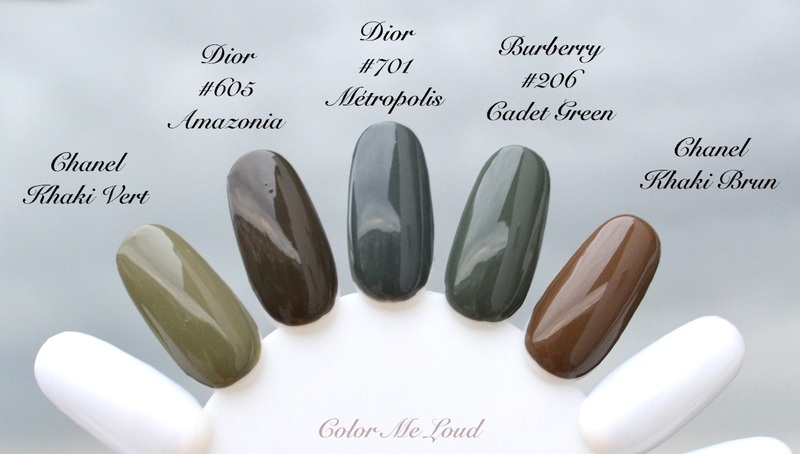 There will be five new Dior Vernis in this collection, #982 Black Out, #791 Darling Blue and #001 Mirror as well as #785 Cosmopolite and #701 Metropolis. Today I would like to share the latter with you as these are the ones I could lay my hands at the moment. By the way the collection seems to be released in Malaysia. I hope it will reach to our shores very soon. 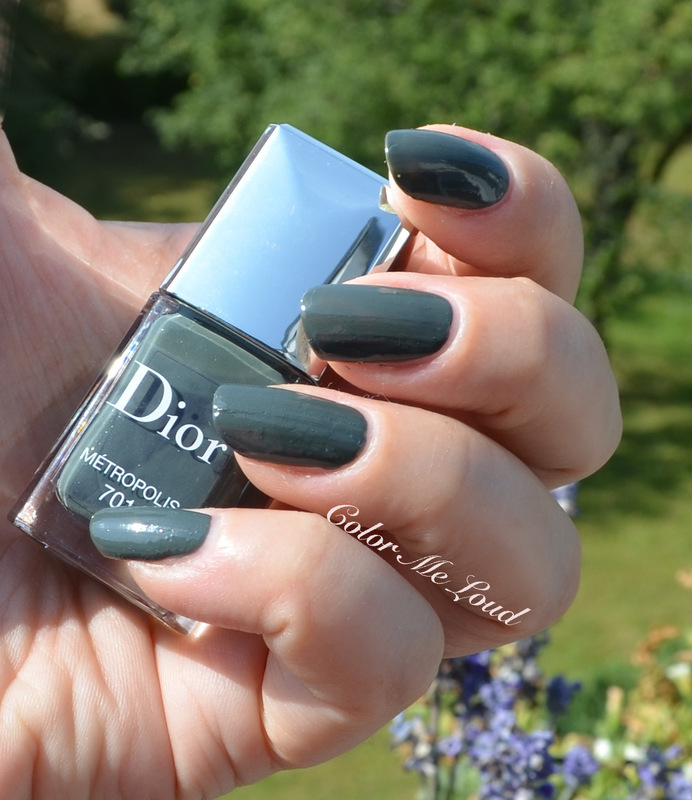 Dior Vernis #701 Metropolish is a deep cool green with ashy, grey undertones. Although I was not wowed the moment I put it on, later on when I compared it to other shades, I appreciated the coolness and the good balanced deepness of this shade. Some Chanel deep greens I own look like black on my nails but this one can be recognized as green while being wearable and not too green, if you know what I mean. I think I will enjoy this shade during the upcoming season. Both of the nail polishes were a little thin in consistency so the best way to apply these is to apply a thin layer first by getting rid of the access on the brush, then build up with the second layer. The swatches are done with two layers. Both of the shades are straight creams without any shimmer. Here are some comparisons of Dior Vernis #701 Métropolis. Chanel Khaki Brun is warmer, more brown, Chanel Khaki Vert is warmer, leans more yellow, thus khaki. Dior #605 Amazonia is deeper, warmer and more brown. Burberry #206 Cadet Green which is also a shade for this fall (review coming up soon) is the closest in my stash. If you would like to pick up more, I would suggest you go for Burberry if you have warmer undertones and Dior if you have cooler undertones. The difference is really marginal though. 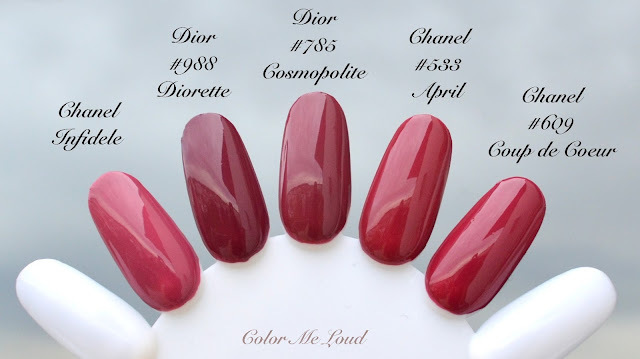 I posted the swatches of both of the shades in Instagram yesterday and there was a clear trend in likes towards the second shade I am about to show you, Dior Vernis #785 Cosmopolite. It is a milky deep to medium pink leaning plum. It is a straight cream and the consistency is close to Metropolis. Again one should go with a thinner layer and build up by the second coat. In two coats it is perfectly opaque as shown in photos below. Cosmopolite is a very pretty fall shade in my opinion. I can't wait to wear it, really super excited about this one. It is kind of classical but in a modern way. It is also very feminine, love it. Now it starts getting dangerous but I want a handbag with this color, I do! Oh and not to forget, there is a matching lipstick in this collection to go matchy with this, Rouge Dior #753 Continental. You can see the first swatch here, a proper review is coming up soon. In Instagram and Facebook there were questions about how Cosmopolite compares to Chanel April and Dior Diorette. Here are some comparisons. Chanel #533 April is warmer and redder. Dior #988 Diorette (review) is deeper and redder. Chanel Infidele is lighter and more rosa. 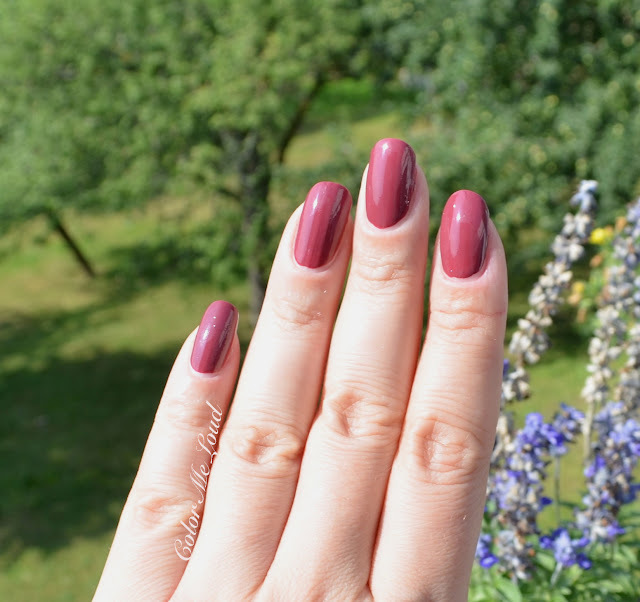 Chanel #609 Coup de Coeur (review) is lighter and less milky. There is no direct dupe of Cosmopolite in my collection but actually if you have any of these shades, you are close enough. Still it is so gorgeous that you would like to add to your collection. 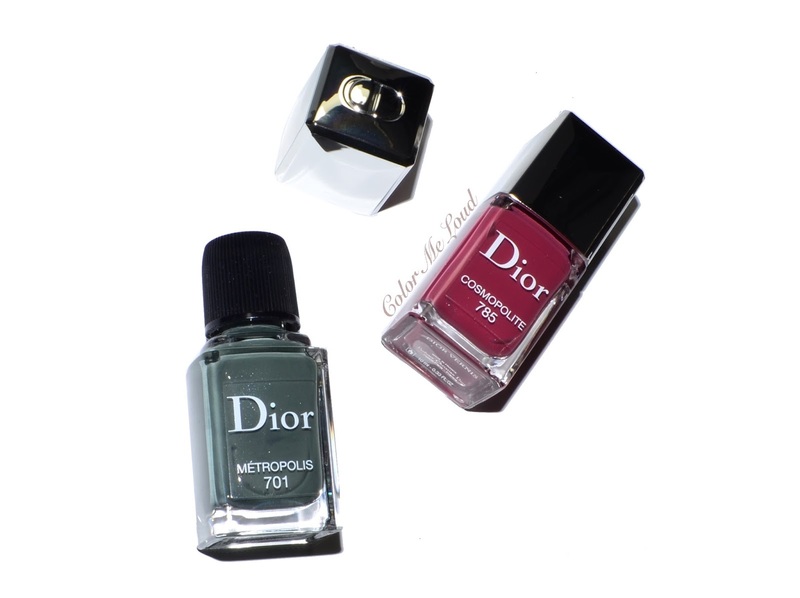 Final thoughts: Both Dior Vernis #701 Metropolis and #785 Cosmopolite are nice hues for the upcoming season. I especially can't wait to wear Cosmopolite, it is so pretty. Are you eyeing any of the nail polishes from Dior Fall Collection? Love them both! Thank you for reviewing them so early. 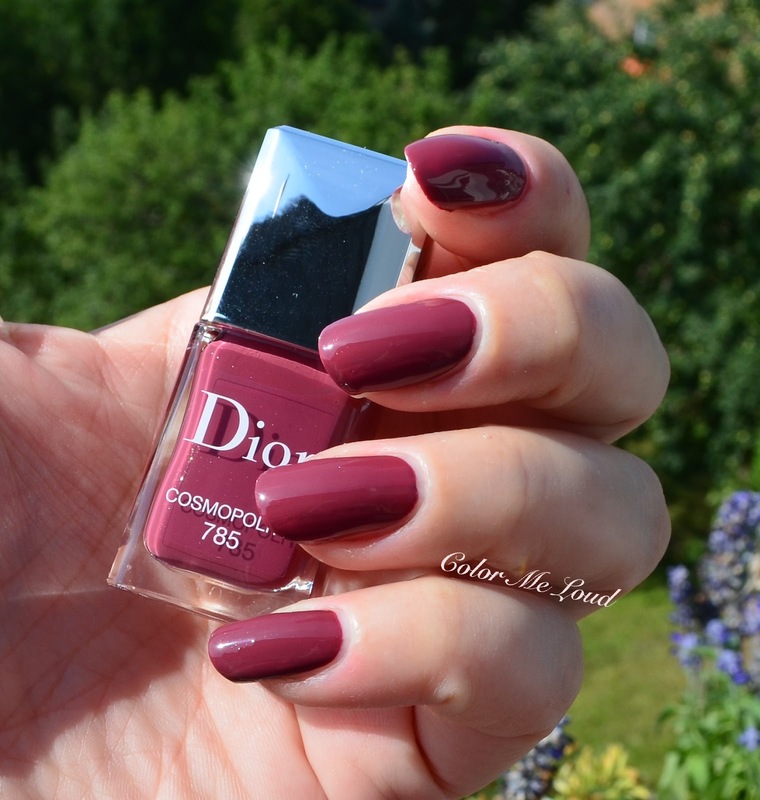 Dior has a great formula - one of my favorite formulas for sure! i love Cosmopolite, but Metropolis is not the prettiest green shade i've seen. i like the comparison swatches better :) thanks for posting!!!!! Oh I wondered about Commopolite being close to Chanel's April. My wall time fave shade in that colour family is Wet N Wild Haze of Love. Much as I would love to snag it, I have a weakness for that colour. So I may just *have* to get Metropolis! Oh I love Metropolis!! I wasn't expecting to, not from the bottle, but it looks so lovely and chic on you! Oh wow, I love Cosmopolite :-O And I really didn't expect to. Pleasantly surprised. Oooh, love these both. Even though I don't feel mentally prepared to think about fall fashion (it feels like summer just started! ), I can picture myself wearing both of these when the weather turns cool. I haven't personally seen anything from Dior Fall. I'm usually a Dior fan girl, but I'm not really feeling it this time round. Honestly, I haven't been feeling it for a while. I thought the blush sticks and liquid shadow look good, but I've been reading negative reviews on the latter (including your review). I like the looks for Metropolis though! I love greyish hues like this. It's too hot here in Italy to be in a Fall mood :-), but I think that Metropolis is a color I'd love to wear next season! yes both of them are really nice. Much better than the last seasons IMO. Yes I like Dior np formula too, also the brush! But on the nails it looks much better. It is also unusual, not khaki like all the greens I have, has a bit of blue, which I like. Cosmopolite is so classical and chic. yes the same here, so hot, all I can think of is not to sweat, let alone fall clothes and fashion, lol. Hahah Lou, I know what you mean. All these shades are just a half tone to quarter tone different and on the nails it is hard to understand the difference. I have to check Haze of Love (what a name, love it) as well. I am so crazy about April, Coup de Coeur and Diorette all but I still picked up Metropolis hahaha, story of my life. I really love Dior Diorette and figure that covers that similar shade of Cosmopolite. I just bought Cosmopolite on your recommendation. It's my first purchase sight unseen based on a recomendation online. Wow. This is the red that I've been searching for. It makes me very sad that it is a seasonal release. Thanks for all the fantastic reviews! I am glad that you liked it after ordering it from my recommendation. Otherwise I would feel responsible of that. Also thanks so much for taking time to leave feedback. Big hugs.